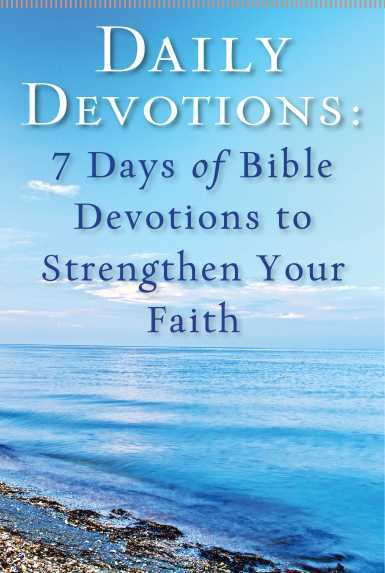 These Christian devotionals will fill your heart with hope, uplift your spirit, and give your faith strength. Every verse in the Bible has an immediate relevance that can bring you closer to God; every Bible quote can help deepen your faith and bring a positive focus to your day. And with this FREE eBook, you can make every day for the next week your opportunity to feel God’s presence in the world—and in your life. Every Bible passage in this eBook is followed by a true story told by one of our writers that reveals its relevance to our lives—showing how this verse can also help you feel more hopeful and help you to develop a deeper relationship with Jesus. Each reading also closes with a unique prayer that will bring the power and meaning of this verse into your own life. You may be very familiar with some of these Bible passages, and some you many not know as well. But familiar or not, each reading is a new opportunity to hear God speaking to you personally in that very moment. You may not know the people who have shared their experiences in the stories that follow each Bible devotional, but you will recognize their daily challenges. Their stories will raise your spirits and give you the guidance you need to face the challenges in your own life. You can find this guidance right now by simply downloading your FREE copy of the eBook 7 Days of Bible Devotions to Strengthen Your Faith.